Small businesses are lean. 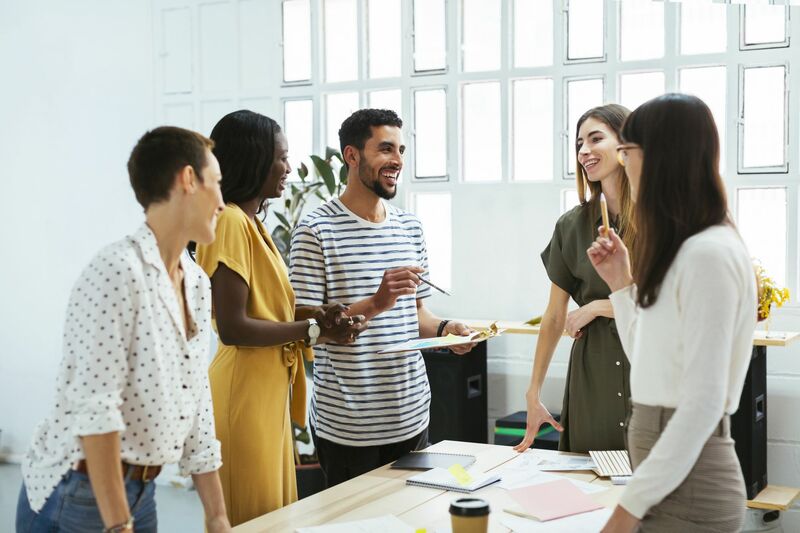 Rarely can they afford high-powered HR teams, pensions, flexible working arrangements or a crop of other big-business benefits, so why do small companies perennially stomp their peers in terms of employee engagement? Gallup’s latest “State of the American Workforce” report found that firms with fewer than 25 workers have the most engaged employees, at 41 percent, while those with the most employees have the lowest engagement levels, at 29 percent. Shouldn’t workers who generally enjoy the highest compensation, benefits and job security be most inclined to do good work? The answer is that engagement can’t be bought, only built as a team. Independent of any legal contract, small employers and their employees have more reason to cultivate a strong social contract. Leaders know that it could tank the company to lose one of five employees, while employees know slacking could result in speedy dismissal. The upshot of this tension is that small employers tend to treat their employees with respect, while employees are more inclined to give it their all. Sooner or later, however, every small business is bound to hire someone who’s happy to go through the motions. And while small teams may be the most engaged, that 59 percent of employees who are disengaged can do a lot more damage to a fledgling company than they could at a larger one. Short of firing unengaged employees, which could also endanger the company, what can small business leaders do to improve engagement? The solution isn’t perks; it’s purpose. A Deloitte survey found that 73 percent of people who work for a “purpose-driven company” are engaged, while just 23 percent of those who don’t work for such a firm are engaged. How can a small firm with comparatively small market impact and even fewer resources build a sense of purpose? At a small business, uncertainty is part of life. But leaders often downplay unknowns, wanting to seem confident and avoid upsetting employees. In doing so, they create distrust and confuse workers about where the company is headed. Startup leaders don’t have to disclose everything, but they should share at least two things with their teams: company goals and financial health. When it went public two years ago, inbound marketing giant HubSpot even went so far as to declare its team members “insiders,” meaning they can see the company’s finances before they’re made public. The company stated it did so to help workers feel more invested in its success. Research suggests that sharing goals, too, can make employees more willing to contribute. Enterprise software firm BetterWorks found that 64 percent of employees say company leaders aren’t transparent enough about their goals. Nearly two in five said that they’d work harder if they better understood their employer’s goals. If a company’s purpose isn’t shared with everyone, it can’t be felt by everyone. 2. Time on the frontlines for everyone. There’s an enormous difference between knowing abstractly that one’s work helps customers and actually helping those customers directly. A University of Michigan study found that giving alumni donation-soliciting call center workers just five minutes with scholarship students who benefited from the fundraising motivated them to bring in an average of $503.22 per week — more than twice as much money as they’d brought in before the meeting. Fortunately for smaller firms, most employees wear multiple hats, so they’re likely to get a chance to interact with customers. Even startup CEOs spend about 45 percent of their time working directly with customers. As companies grow, however, that everyone-takes-a-turn culture tends to fade. To keep purpose in mind, teams — particularly their leaders — must resist that tendency as they scale. 3. Empathy at every turn. For most startups, the early years are a struggle. Employees work late, tackle projects beyond their title and establish processes through trial and error. When leaders don’t recognize the sacrifices employees make in the company’s name, workers begin to question why they’re working there at all. Empathy promotes a sense of purpose because it proves the company cares about more than its bottom line. More than two in three workers in tech, finance and healthcare say they’d take a pay cut to work for a more empathetic organization, according to Businessolver’s 2018 “State of Workplace Empathy” report, while 90 percent of all workers say they’re more likely to stick with an empathetic employer. Small companies may worry they can’t afford the perks workers want, but they have something even more powerful: an atmosphere of purpose. Employees of small businesses tend to build personal relationships with their leaders, interact regularly with the people they help and care about one another beyond their bottom-line contributions. The challenge is making sure that everyone buys into that environment, no matter what else the business can or can’t afford.